SUVs are becoming popular in India. The shabby quality of indian roads and introduction of fuel efficient diesel engines in SUVs are making the adoption fast.High cost of ownership, price, maintainence cost have ensured that only the rich can use SUVs.Premier's introduction of SUVs were aimed at common man's vehicle.They failed miserably in the first attempt with Rio.They are back with Rio refresh. It is a big vehicle.The design has been updated from the model released three years ago.The change is intended to make it contemperorary and beautiful.Clearlens foglamps is designed to look modern.5 Spoke steering wheel and mirrors fitted with side indicator has changed the look of the vehicle. Eventhough the look is of SUV size is of a hatchback.So moving around is same like that of a hatchback.Since seats are placed at a height 360 degree vision is a bonus.This will help city drivers.Parking is also easier with the small size. Rear seat designs reminds us of old CRV.Spare tyres are fitted in the rear door as seen in offroad vehicles.Tail lamp design is made for SUV.The modernity gets lost when you enter the vehicle.Dashboard design reminds us of ALto and WagonR.Plastic quality and operational quality of the switches are only average.Sporty seats do not dampen our spirits on long journeys.However the rear seat does not give back support. The remarkable change is that 2DIN music system is present in the LX variant.The absense of special open/close switches for ac vents on door and central console and bottle holders is a negative of the vehicle.Even the top end variant does not have rear power windows.The colour of door trim and door lever shows the antiquity. In the instrument panel, everything is digital except odo reading meter.Everything can be read clearly.ABS, Electrically adjustable mirrors comes with DLX,LX models as standard features.15 inch alloy wheels, spare wheel cover,2DIN stereo etc are optional features of LX variant. Old Rio had the same engine of Fiat Punto,Swift,Tata Indica.The Common Rail Fiat engine is the same now also.71 bhp is the power at 4000 rpm.Even though engine is the same driving lacks force compared to Swift and Indica Vista.The culprit here is the weight of the vehicle.Turbo lag is present below 2000 rpm.Accelerator response, gear shifting and noise insulation needs improvement.Engine noise in more at higher rpm. Mcpherson Strut suspension seen is cars is in the front and 5 link suspension seen in SUVs is in the rear.Unlike Renault Duxter and Mahindra XUV500, Rio is a rear wheel drive vehicle.Good stability at rough roads is the plus of 5 link suspension.200 mm ground clearance makes you possible to drive Rio on bad roads.No problems for the passanger when travelling in damaged roads.Stability at higher speeds and performance of steering is satisfactory. 18 to 20 kilometer per litre of diesel can be expected at highways.In cities and at high speeds you will get something below 15. 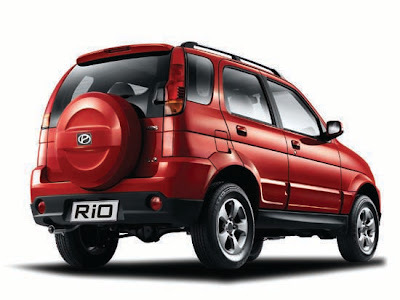 Rio is good for village and city roads.IT is a good vehcile to go for a tour.For those who want to own an SUV but are not doing it because of high price can go for Rio. Premier Rio is made for those who just want to drive a powerful,compact and stylish SUV.It got perfect features but there are better option than it.